'Hymnography Unbound' blog with comments on hymns and their use. Christmas Hymn Files from the 1940 Episcopal Hymnal. By Rob Getman. Offering a Christmas sermon, with Biblical annotations, and downloadable hymn midi file. The hymn Stabat Mater Dolorosa is often attributed to Jacopone da Todi. Brief history, text of the hymn in Latin and English. Offers a community of resources and support to help people get organized for Christmas throughout the entire year by creating and organizing a Christmas Notebook. Carefully chosen Christmas clipart, pictures and animated Xmas images and backgrounds. Offers a small collection of country style Christmas clipart including Santa and Mrs. Clause, a nativity scene, snowman, reindeer and a animated Christmas tree. Origin of the Moravian Star, the Christmas Putz, the candlelight Christmas Eve service. Offering Christmas clipart for personal use, that includes backgrounds, Santa, Christmas trees, holly, bells, children, and reindeer. Much of this is original clipart and graphics that has been scanned and edited. Links to songs 1-415 from the Free Will Baptist Hymn Book. Links to Selected Scripture Responsive or Unison Readings 416-517. Free MP3s of Christmas carols, holiday songs and lyrics featuring modern renditions of traditional Christmas carols and original songs. Get creative Christmas letter writing advice and ideas, or use the instant letter generator to automatically create a personalized Christmas letter. Features some of the most popular Christmas poems and stories. Also includes list of ways to say 'Merry Christmas' in different languages. Offers holiday tales for all ages as well as how to say Merry Christmas in several languages. Christmas-related graphics, recipes, and Santa sites. Family shares Christmas traditions and holiday greetings. Mooresville, Indiana holds an old style Christmas entertainment event. Guitar chords and midis for many popular Christmas songs. Includes Christmas craft ideas and printable coloring pages. Provides Christmas history, traditions, recipes, carols, and kids activities. Videos, FAQs, and a discussion forum regarding many aspects of Christmas lights. Essays and short meditations on Christmas. A poem about a lonely soldier on Christmas Eve. Author unknown. Christmas images for wall papers and midis to download. Links to plenty of Christmas jokes and song lyrics. Poetry and inspirational Christmas writings. Background hymns. A Christmas light show located in Wendell, North Carolina. If the business hours of Ploth, Kathleen in may vary on holidays like Valentine’s Day, Washington’s Birthday, St. Patrick’s Day, Easter, Easter eve and Mother’s day. We display standard opening hours and price ranges in our profile site. 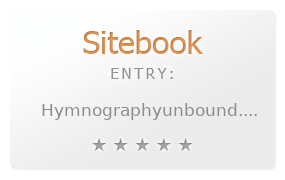 We recommend to check out hymnographyunbound.blogspot.com/ for further information. You can also search for Alternatives for hymnographyunbound.blogspot.com/ on our Review Site Sitebook.org All trademarks are the property of their respective owners. If we should delete this entry, please send us a short E-Mail.